Konftel C2055 is the perfect video collaboration solution for medium-sized meeting rooms, combining the Konftel Cam20 4K conference camera and the Konftel 55 speakerphone with OmniSound® audio quality. The Konftel OCC Hub brings everything together into one convenient kit, so a single USB cable is all you need to connect the camera, the sound unit and the room’s screen to the collaboration app on your laptop. 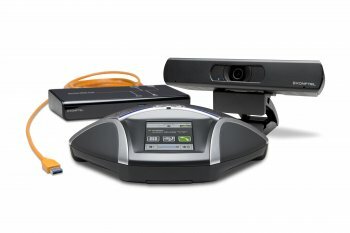 Konftel OCC Hub is, as the name suggests, the hub of the video collaboration solution, offering One Cable Connection to the conference camera, speakerphone, and screen. In practice, this means that C2055 fully supports BYOC – Bring Your Own Computer, where the user can bring the collaboration service to the meeting room on any laptop with a USB port. The Konftel 55 is a stylish and easy-to-use speakerphone with impressive, crystal clear HD sound thanks to our patented OmniSound® audio technology. The video conference sound from the computer can be bridged with calls via a desk phone or mobile phone and it’s easy to switch and combine connections on the touchscreen. Another cool feature is recording onto a memory card. Whatever your preferred collaboration app or cloud service, the Konftel C2055 will take care of the experience in your medium-sized conference room. Bring your meeting with you on any laptop with a USB port, plug it in and you’re good to go. We call this BYOM – Bring Your Own Meeting. The Konftel Cam20 is optimized for situations where the conference cam needs to be positioned close to the table, but it is equally at home in medium-sized meeting rooms. The 105° field of view means that all the participants can sit in a comfortable position and still fit into the video image. At the same time, the camera creates a realistic image with no distortion. If you have an extra screen, you can connect it directly to the camera’s HDMI port, while the video image is being transmitted to the meeting via USB. This gives you a monitor that shows your side of the transmission in the room at all times.